It’s been a jam-packed past year but the greatest push of it culminated throughout the past month. I find myself now in the rain shadow of a solo show, which dovetailed with a massive studio purge and re-org, and followed by a chaser of insights into my creative process. A Holy Trinity of tensions and releases, really. Then there are the After Effects from all of it. I can name three. After Effects of the Solo Exhibit — I created the works for my solo show over nine months’ time. 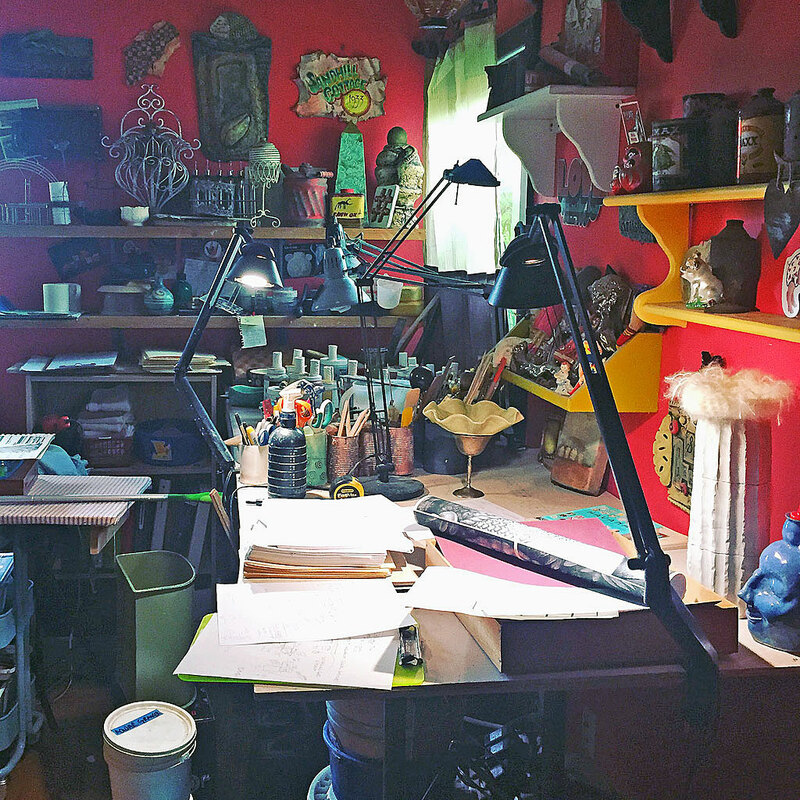 The parts, pieces and possibilities took over my creative space and nearly all my thoughts. It was great fun, actually, to be so willingly swept away. At showtime, however, all those projects left together and the tidal surge of purposeful focus and activity ebbed away, leaving me beached and a bit bereft. Fortunately I have come to expect this and was already looking beyond it by planning the Next Things. That sort of segue really really helps. What caught me by surprise was that my tiny studio was clearly wrecked, as you can see above. (The rest of the space was woefully worse and I could only walk in about 18 inches.) As I half-heartedly began to tidy my way in, it felt daunting: the normal touches of post-exhibit funk combined with literal blockage, not enough space to sort it out and no sane or happy way to begin even one of the projects I had on the clipboard. One cannot organize clutter, but one can purge. So I purged. After Effects of the Purge — The purge became a total remodel: new huge storage shelves, new task lighting, new configuration of workspaces. It is still in the fine-tuning stage as I write, but enough radical rearrangement has occurred that I can no longer find things automatically, even if nothing is in my way. It’s created an odd Not-My-Life sensation. I bump into the edges of the new configuration, walk to the “old” spot to set something down, and feel like a visitor in my own place. As a kid I used to get all happy deep-cleaning my room (I know, that’s weird…) but then I would sit in it feeling strangely empty, utterly afraid to mess it up again. It’s sort of like that now in the studio and I relate it to the very real fear of a blank canvas. I gingerly started and stopped several new projects, making sure to stow them neatly on my designated Works-in-Progress shelves. But that feeling of needing things to stay unsullied is death to creativity, at least mine, so I spent some time wondering why and how I needed to be creative at this new juncture and had some freeing insights. After Effects of the Insights I’ll spare you the wonderings and just cut to the epiphany and what it might mean. All this time (decades) I have thought that the art objects that I made, and especially what of them I shared with the world, were the point of my carefully coddled creative process, the crux of the biscuit, as it were. That a favorable reception of the beautiful things themselves – by me or anyone – was the goal. It’s not. I realized that the physical objects I make are merely the by-products – sometimes even detritus – of the process itself. Their existence, aesthetics, esteem, and economics are diversions. The classes, art biz books and websites, coaches and gurus, mentors and clay buddies, ceramic sales, festivals, exhibits, competitions and online events are busywork. My carefully defined core values, product families, price points, merchandising methods, and selling style are gimcrackery. The countless artist statements, social media posts and magnificent manifestos? Fluff. I’ve suffered failures, imagined slights, had inappropriate envy, false hope and creative exhaustion, thinking it was all necessary to the cause. Guess what? It’s not. When these realizations sunk in so deeply that I felt the truth of them in my bones, in my interstitium, in my vagus nerve, I laughed out loud. For me, in this lifetime, Process is the Product! Any residuals are delicious gravy. The core reason I create is to give myself something I want to look at, marvel over, and fall in love with. Nothing more is really needed. –Liz Crain, who of course reserves the right to carry on with the whole biscuit, apostrophes and all. Congratulations! You’re getting there,. Actually, you are arriving. The process is infinite and is so rich! Keep growing. I enjoy reading you. Thank you Syd! It means a lot to have this recognized as it is quite heady stuff, no?